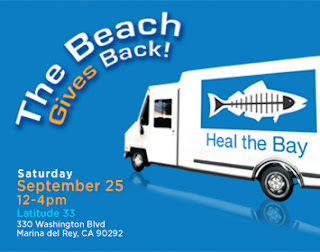 Latitude 33 is throwing a fundraiser on Saturday, September 25, as a benefit for Heal the Bay to be held immediately after Coastal Cleanup Day at noon. The Event will feature cuisine from over 20 of LA’s famous gourmet food trucks, 10% of all food truck sales, as well as attendee donations will benefit Heal the Bay and the International Bird Rescue Research Center to give back to our beaches. Open to the public, the September 25th fundraiser will be held from noon to 4:00 pm on site at Latitude 33 in Marina Del Ray. Celebrity TV Host Carson Daly, an avid supporter of Heal the Bay, will support the event with on-air promotion for The Carson Daly show that will be broadcast nationwide to request further donations for Heal the Bay and IBRRC. Over 20 of LA’s most notorious and ever-popular food trucks will be serving up delicious, varied bites satisfying all cravings from crepes, lemonade, dim sum, grilled cheese, hotdogs, shaved ice and tacos.